The following is the witness of Joe Gaffarena. Without being disrespectful, the translation of this witness indicates his lack of education. Although he is an illiterate businessman his success is due to his cunning, his connections, his illegal activities and a lot of luck. 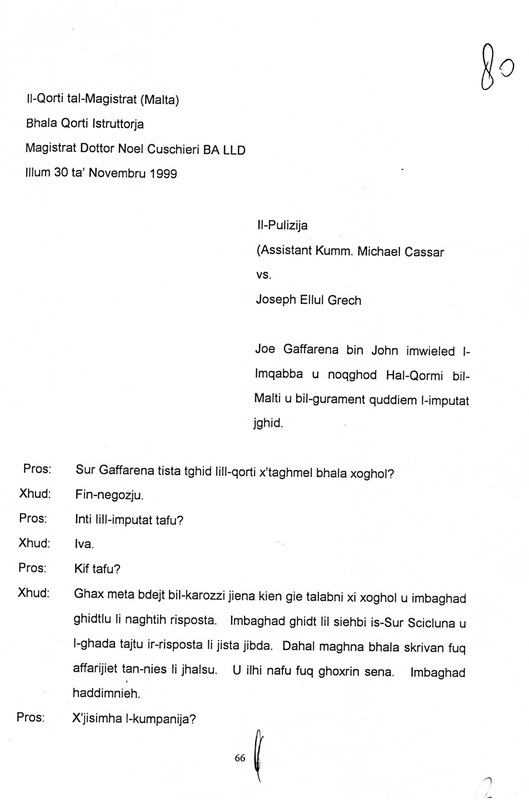 PUBLISHED BELOW IS A COPY OF THE ORIGINAL COURT TRASCRIPT IN MALTESE. 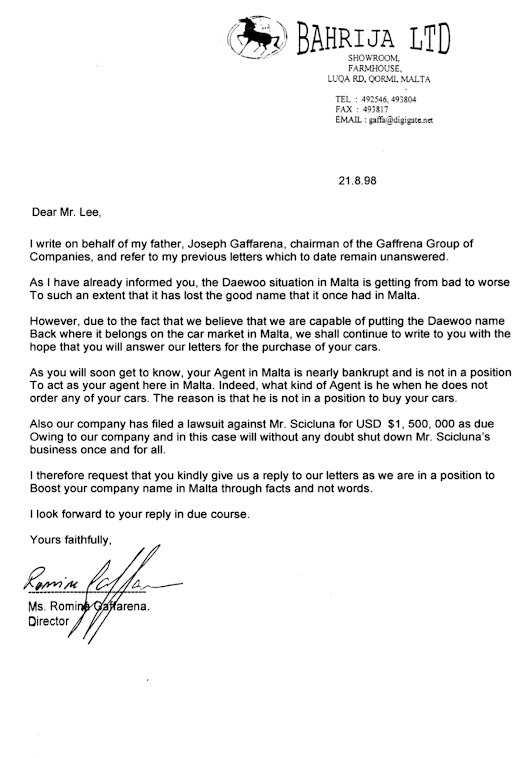 THERE ARE ALSO COPIES OF THE ORIGINAL LETTERS THAT JOE GAFFARENA WROTE TO DAEWOO IN KOREA. THEY CONFIRM THAT JOE GAFFARENA TRIED TO STEAM ROLL OVER HIS EX PARTNER J.M. SCICLUNA TO ACQUIRE THE AGENCY BACK AFTER HE HAD SOLD HIS INTEREST IN THE SAME BUSINESS FOR MILLIONS OF EUROS AS REPORTED IN THE MALTESE MEDIA. ONE OF THE LETTERS IS DATED 1ST MARCH 1999 JUST A FEW MONTHS PRIOR TO THIS CASE. The lack of evidence, conflict of interest, deceit, perjury and much more are evident in this case. Nonetheless, the way in which the police conducted themselves during their investigations and court proceedings, including the way court procedures develop, give a short insight into Maltese political corruption and abuse of power. This also confirms that the Maltese Judiciary has been in serious decline for many years. EU Commissioner John Dalli had a long business relationship with Joe Gaffarena going back to the 1980’s. In the early 1990’s John Dalli’s brother Bastjan was a business partner with Joe Gaffarena and J.M. Scicluna (Honorary Philippine Consulate in Malta). After leaving the business Bastjan bought Mixer Ltd., from Joe Gaffarena. This concrete business had been operating without planning permission for many years without any difficulty. 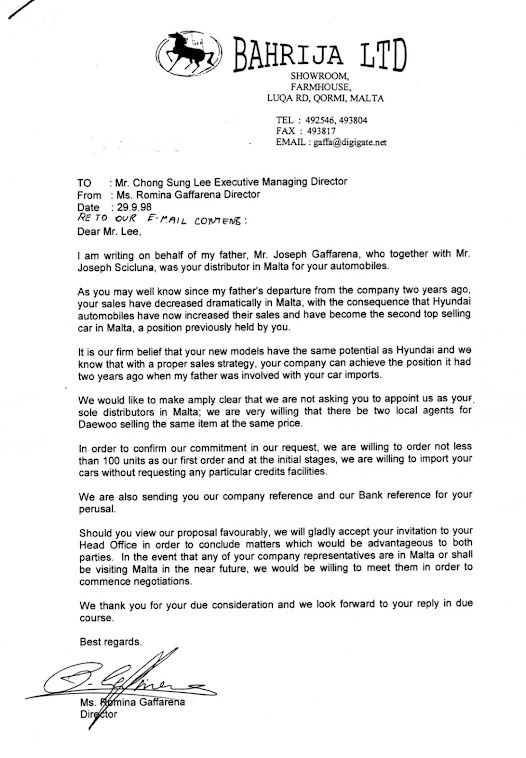 John Dalli was also engaged as consultant by the company when Joe Gaffarena sold his interest in the Daewoo car sales agency to Scicluna. 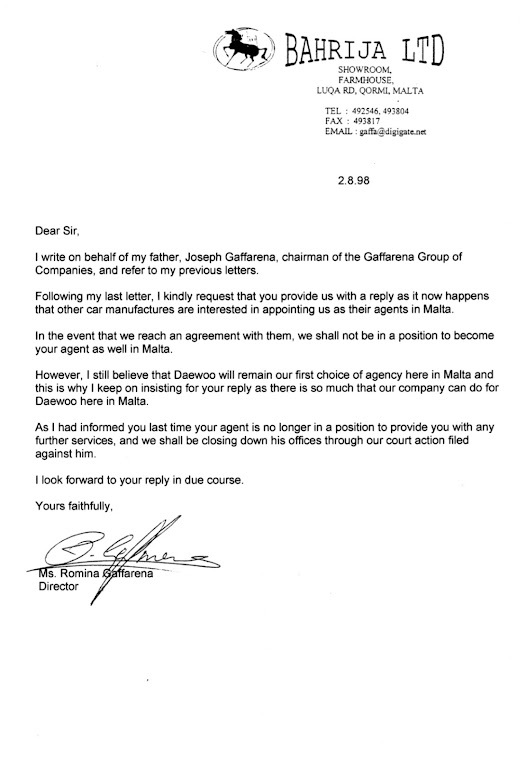 Joe Gaffarena did very well out of this despite the fact that the agency agreement was due to run out and there was no written agreement with Daewoo that they had any intention of extending it. For his interest Gaffarena received several properties, one of which was the Three Rocks Hotel, large plot of land in Bahrija, two large garages in Qormi, vehicle storage facility at Hal Farrug large enough to park 400 vehicles, Dacia Car Sales Agency, Dacia vehicle stock and spares, a showroom in Valley Road, Birkirkara as well as cash payments, bank transfers and bankers drafts. His interest was sold without liabilities. These funds were raised from Bank of Valletta on behalf of Joseph Mary Scicluna (Honorary Consulate for the Philippines in Malta) using inadequate collateral to secure the facilities. The transfer of Gaffarena’s interest must have been the most unethical way of conducting business. There was no realisation of assets or audited financial reports for the years the business was in operation. 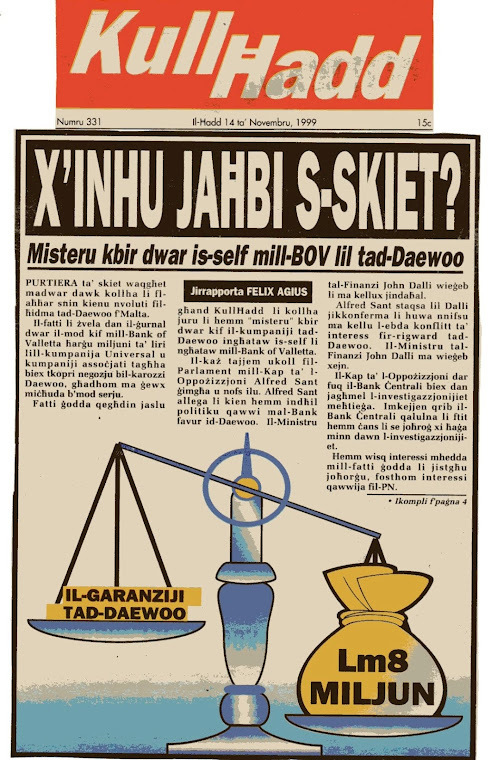 During this period the Maltese media was continuously publishing articles about the Daewoo scandal. The Labour Party in opposition demanded an investigation into the fraud and corrupt practices that took place. 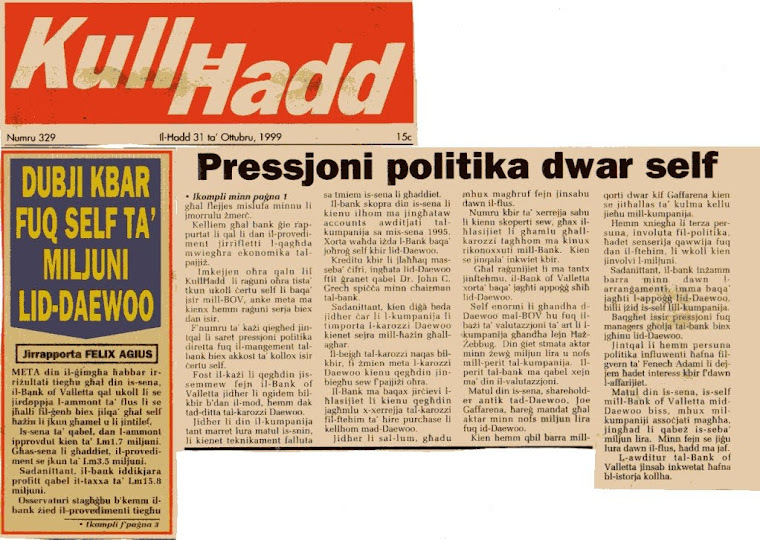 John Dalli falsely and maliciously accused the defendant to cover up his involvement in the scandal. 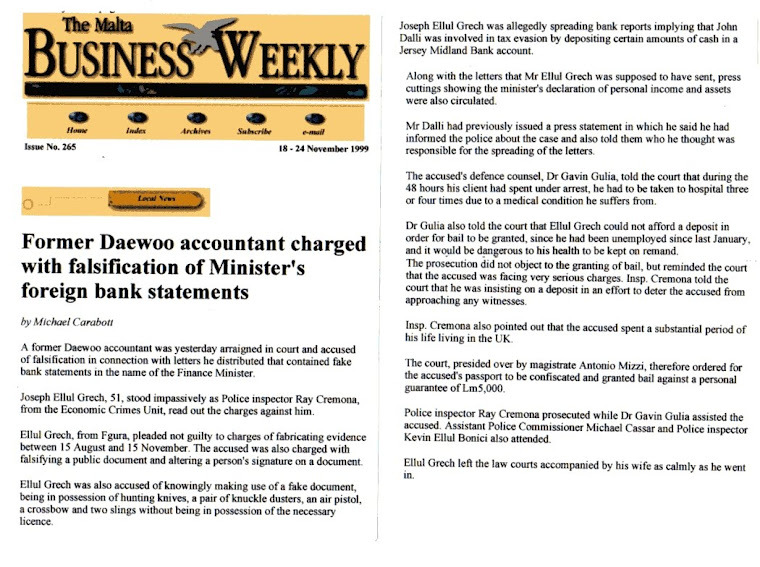 John Dalli also chose to use his back stabbing business friend to give witness. Gaffarena was the only witness EU Commissioner John Dalli brought forward. During his cross-examination he replies in riddles, he lies and says things that are very damming against John Dalli. Despite this the court and the Attorney General allowed the case to continue overlooking the fact that there was no evidence to connect the defendant to this crime. 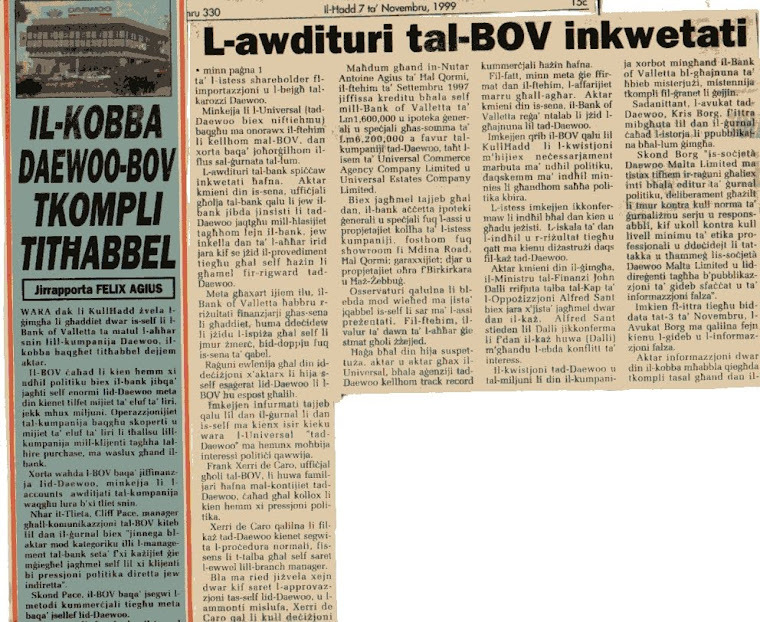 The evidence published on this site confirms beyond reasonable doubt that EU Commissioner John Dalli colluded with the police, judiciary and others to frame the defendant. John Dalli had the motive finances and man power to commit this crime. Prosecution: Mr. Gaffarena can you tell the court what your occupation is? Prosecution: Do you know the defendant? Prosecution: How do you know him? J. Gaffarena: Because when I started with cars he came and asked me for employment. I then told him that I would give him an answer. I then told my partner Mr. Scicluna and we sent him a reply that he can start. He started with us as clerk of things people buy and pay for. (First lie of many, the defendant was offered employment after he had placed and advertisement in situations wanted in the local press. The company’s Financial Controller interviewed the defendant in competition with other applicants for the vacancy. The defendant accepted the position because he had known Gaffarena for many years and he needed employment). Prosecution: What is the name of the company? (Meaning “with Daewoo”. Joe Gaffarena speaks with a broad Maltese dialect. His accent is so broad that the transcriber had difficulty interpreting what Gaffarena had said. The reply should have been mad-Daewoo not Mad-De-Rue). Prosecution: What happened then, did he continue to work for you? J. Gaffarena: No. 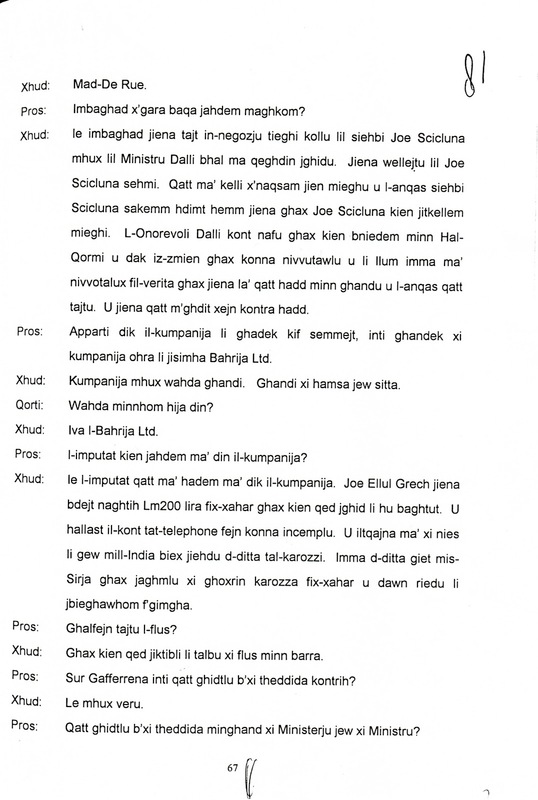 I then gave my share of the business to my partner Joe Scicluna, not to Minister Dalli as what is being said. I sublet it, my share, to Joe Scicluna. I never had anything to do with him nor did my partner Scicluna until I worked there and Joe Scicluna used to have words with me. I used to know Honourable Dalli because he was from Qormi and at the time we used to vote for him but today we do not vote for him. (Joe Gaffarena lied. He sold his interest in the business to Scicluna. John Dalli, Joe Gaffarena and J.M. 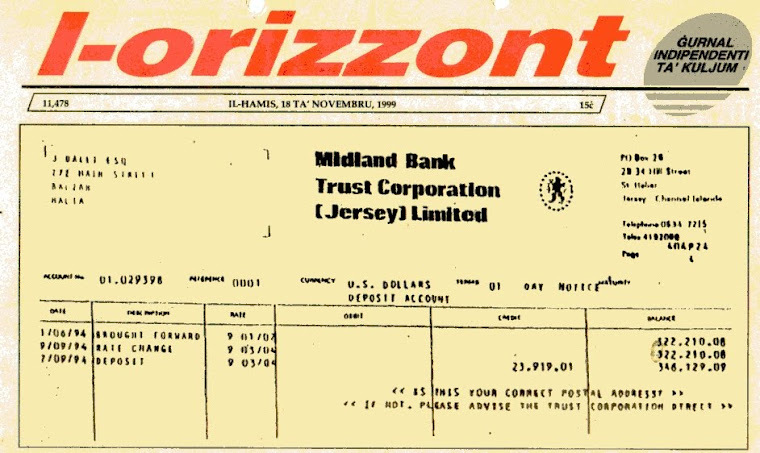 Scicluna were involved in the biggest known fraud case in Maltese history. Gaffarena took the lion’s share in millions as reported in the Maltese press. 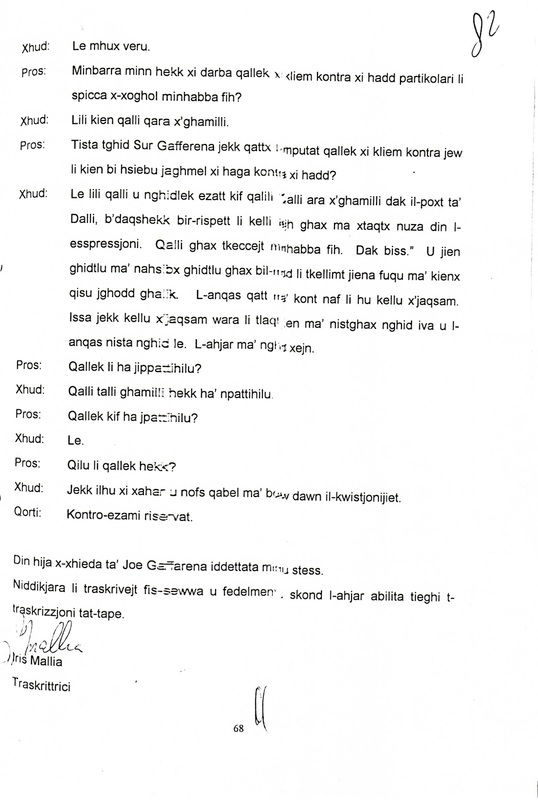 The defendant knew Gaffarena since 1980 when he used John Dalli’s services to raise funds to build a pig farm at Hal Farrug. The defendant was also in Gaffarena’s employ from September 1995 to January 1999. This witness committed perjury so many times in his witness it is unbelievable). 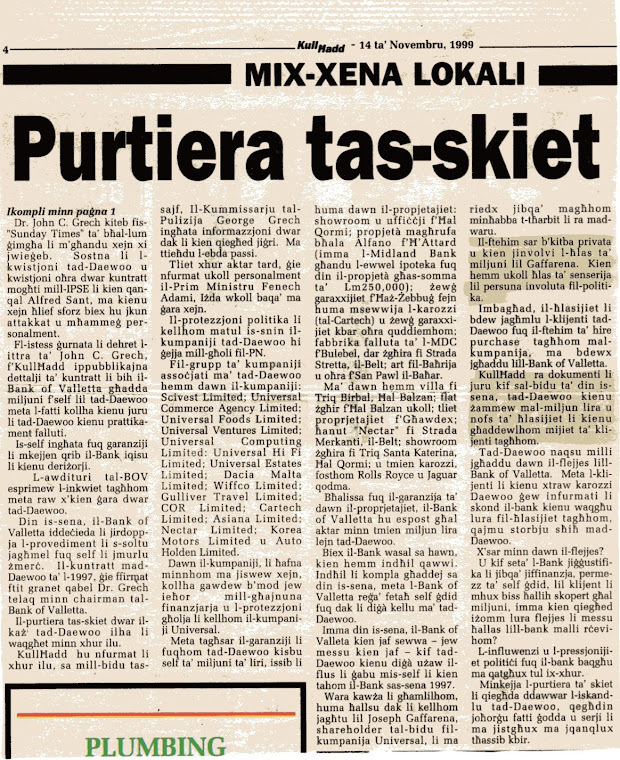 (Gaffarena’s business relationship with John Dalli goes back to 1980. A few months before Gaffarena sold his interest in the Daewoo agency, Dalli was engaged by him as consultant and his services were not free. John Dalli received a monthly fee, a Daewoo Espero in white chassis no: KLATF19Y1SWB739096. This was registered in his wife’s name. He also received a Daewoo Cielo in black chassis no: KLATF19Y1SB598856 registered in his eldest daughter's name). Allegedly John Dalli also received a generous backhander amounting to €1.2 million (Lm0.5 million)for being ”Mr. 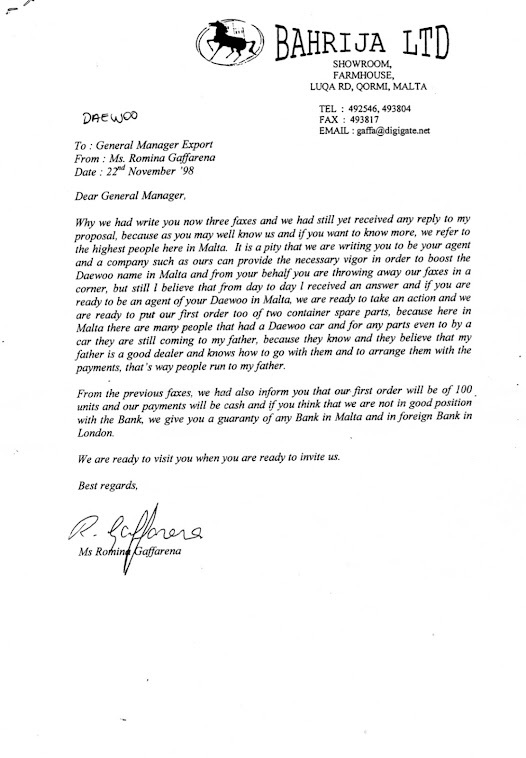 Fix It” with the company’s bankers when Gaffarena sold his interest in the business. EVIDENCE TO SUPPORT THIS IS AVAILABLE. Prosecution: Apart from that company you just mentioned do you have another company named Bahrija Ltd.? J. Gaffarena: Companies, I have more than one. I have five or six. Magistrate: One of them is this? J. Gaffarena: Yes Bahrija Ltd. Prosecution: Did the defendant use to work for this company? J. Gaffarena: No the defendant never worked for this company. Joe Ellul Grech I started to give him Lm200 (€450) per month because he was saying that he was having a hard time. (Gaffarena is trying to give the impression that he is a charitable person by giving money to the defendant. Gaffarena paid money because he was getting something back for it. He paid the defendant’s phone bill because the defendant was making overseas phone calls on Gaffarena’s behalf. 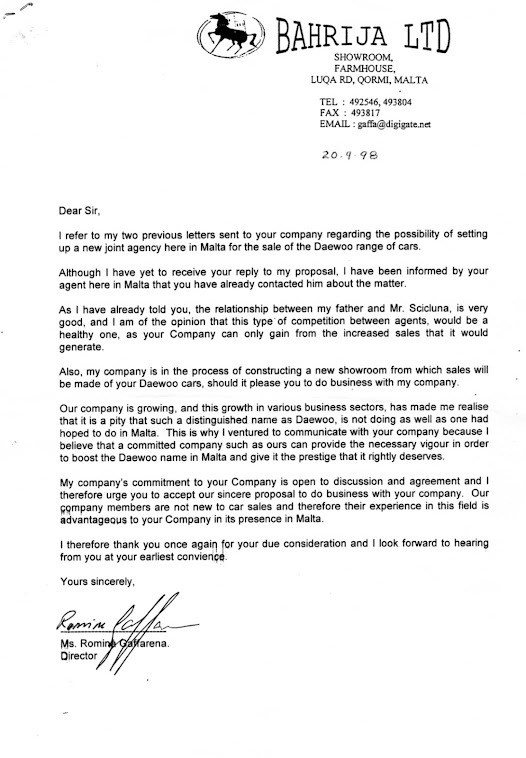 After selling his interest in the Daewoo agency to Scicluna, Gaffarena tried his utmost to acquire the Daewoo agency from his ex partner in an underhand, deceitful and unethical manner. He tried to acquire the agency long before the defendant resigned from the company). Below is documented evidence to support this. These are copies of correspondence on Bahrija Ltd letter headed stationery. Signed by Gaffarena’s daughter Romina as Director and Chev. Joseph Gaffarena as Chairman. This correspondence makes very interesting reading and speaks volumes. Prosecution: Why did you give him money? J. Gaffarena: Because he used to write for me and they asked for money from abroad. (Gaffarena does not give money because of his generosity). Prosecution: Did you ever tell him of any threats against him? J. Gaffarena: No not true. Prosecution: Apart from that did he tell you anything against anyone in particular that he lost his employment because of him? J. Gaffarena: He had told me look what he did to me. Prosecution: Can you say Mr. Gaffarena if ever the defendant told you anything against or that he had it in mind to do something against anyone? J. Gaffarena: No, he told me and I tell exactly “look what Dalli did to me that two faced Dalli no more respect for him” but i did not want to use that expression he told me he lost his job because of him. That is all. And I told him I do not think so. And told him that I had words about him but it does not concern you. I did not even know that he had anything to do with. Now, if he had anything to do with it after he left I cannot say yes and I cannot say no. It is best not to say anything. Prosecution: Did he tell you he was going to make him pay? J. Gaffarena: He told me I will make him pay for doing this to me. Prosecution: Did he tell you how he was going to make him pay? Prosecution: Was it long ago that he told you? J. Gaffarena: It could have been a month and a half before this started. 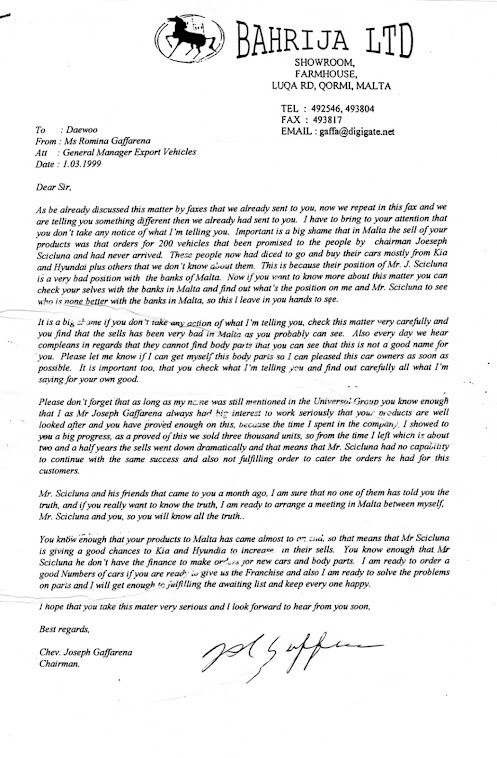 (That was soon after that the defendant returned from London with Gaffarena. How could anyone think that framing the defendant must have started earlier). This is the witness of Joe Gaffarena as dictated by him. I declare that this transcription is made in good faith and faithful and to the best of my ability transcribed from the tape. Joe Gaffarena gave his witness after Inspector Raymond Cremona, Assistant Commissioner Michael Cassar and John Dalli. At this stage it was more than obvious that there was no evidence against the defendant. It was also evident that all the witnesses so far committed perjury and colluded to frame the defendant. Magistrate Dr. Noel Cuschieri missed the opportunity to dismiss the case. His negligence implicates him in the frame up and is collectively responsible for breaching the defendant’s human and civil rights. This man is still passing judgment on Maltese citizens. John Dalli – Is He His Brother’s Keeper?